Simon's favourite meal is turkey dinner with all the fixings. 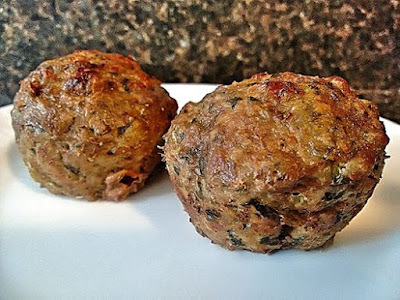 If you follow this blog regularly, you'll know that I love to work with ground chicken and turkey to make meatballs and burgers. Ground chicken is inexpensive, and you can hide all kinds of veggies in the mixture! I wanted to create a meatloaf recipe that would be easy to prepare in advance and reheat for a weeknight meal, and that captured the flavours of a traditional turkey dinner. These would be great paired with turkey gravy and mashed potatoes. The muffin tin sized meatloaves allow you to bake them in advance, freeze them, and defrost the number of portions that you need for a weeknight meal. Just reheat them in the microwave. After making these for the first time, I think I need to invest in a silicone muffin pan for next time, since it was hard to get completely clean. Update: I purchased silicone muffin tin liners from Ikea (they come in a 20 pack). I had to make the meatloaves a little smaller to adjust for the liner size, so the yield was larger (18 meatloaves). I baked them for 30 minutes with the foil on, removed it, put them back in for 18 minutes, scooped them out of their liners and they were a bit wet on the bottom, even though the tops were nicely browned. To fix that problem, I put them on a baking sheet, with the wet side up, and put them under the broiler for 5 minutes. This also worked great. You can, of course, use the same recipe and make them into meatballs if you prefer not to use a muffin tin. For meatballs, bake at 425°F for 22-24 minutes. Place mushrooms, spinach, onion, and garlic in a food processor and grind into small pieces. Transfer vegetable mixture to a large bowl. Add dried herbs and spices, egg, breadcrumbs, olive oil and ground turkey. Mix until uniform. Preheat oven to 375°F. Spray a muffin tin with canola oil to grease. Divide turkey mixture into 12 equal portions, and form each portion into a ball. Place each into a muffin cup. Cover the muffin tin with tin foil and bake for 30 minutes covered. Carefully remove the tin foil and bake for an additional 20-22 minutes uncovered, until mini meatloaves are browned on top. Remove muffin tin from oven and place on a cooling rack for 3-5 minutes, then remove each mini meatloaf to serve immediately, or allow to cool fully, then freeze.